Today my daughter and I drove down to Venice Beach, CA to bike on our favorite bike path. Beach parking at Venice or Santa Monica can be expensive. The price changes according to season. In the summer, it can be as high as $14, but if you get there before 9:00 am, it is half price. Today we got there at 8:55 and paid $6.00. We like to park at Venice Blvd., leave the bikes in the car, and go eat breakfast at the Sidewalk Cafe. 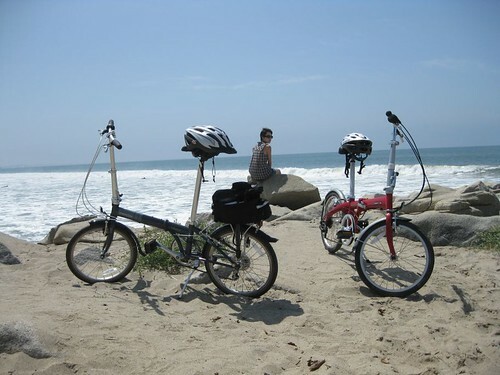 Then we walk across the beach to the water and sit contemplating the waves for a bit before we get the bikes out. 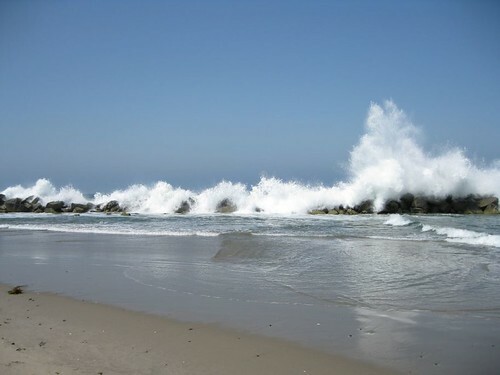 Today the surf was pretty rough. The boardwalk between Venice Blvd. and Rose Avenue is basically street carnival all day. Hucksters are selling jewelry, bikinis, suntan lotion, paintings, tattoos, sunglasses, hemp products, medical marijuana, doodads, t-shirts, toys, refrigerator magnets, dolls, fortunes, CDs, and anything else imaginable. Street musicians and other performers play for tips. Tourists from all over the world stroll back and forth. On this day, there were lots of French for some reason. On other days, there were lots of Germans. I don’t have any pictures of the boardwalk at the moment, in part because for all these street characters, this is their gig, and if you take a picture they want a tip. That is perfectly legitimate, in my view, but I wasn’t in the mood for all of that interaction and negotiation. I love the boardwalk, though. It is cheap, sassy, desperate, and real. 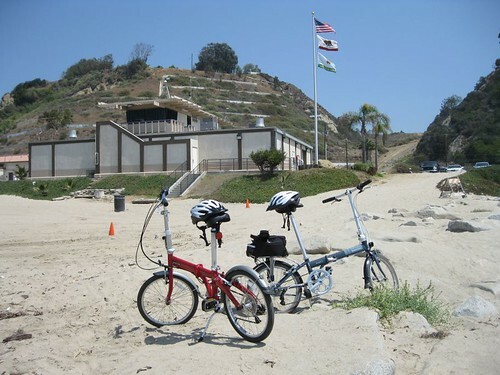 Here’s a shot of the life guard station, with the bike in the front. Note my new white and silver Bell Triton helmet. My daughter was wiser in her choice of helmets from the beginning, selecting a white Giro (on the red bike). The bike path is great, except that, as noted in a previous post, it is full of non-bikers. Pedestrians cross the path without looking either way. People allow tiny little girls to sit on the path and play. Groups of friends stand in the middle of the path to converse, blocking traffic either way. Folks, there are bicyclists going 20-30 miles per hour both ways, and this is what the path is for. The speeding bicyclists are in the right, and if you get hurt, it’s your fault. We discovered today that it is easy to stop at both Mitsuwa (Japanese grocery items) on Centinella and Trader Joe’s on Sepulveda on the way back to the freeway. This satisfies nearly all of our grocery needs and makes a biking trip to Venice Beach existentially efficient!